If you have been charged with a criminal offense or arrested for DWI in Evesham Township, New Jersey, the experienced criminal defense lawyers at our firm can help you successfully navigate the tough road ahead. Depending on the specific criminal charges or traffic tickets you were issued, you may be facing penalties including suspension of your driver’s license, significant fines, a conviction on your criminal record, and time in jail. Our criminal defense attorneys regularly appear in Evesham Township Municipal Court on behalf of clients facing a broad range of charges, such marijuana possession, simply assault, disorderly conduct, and possession of CDS in a motor vehicle. Our law firm, led by former Deputy Attorney General turned defense attorney William C. Fay, focuses entirely on criminal and DWI defense. Mr. Fay has been defending individuals facing criminal charges for years and he uses his experience as a former prosecutor to provide the most compelling and effective defense for his clients. If you are required to appear in Evesham Township Municipal Court for criminal or DWI charges, contact us for a free consultation with a knowledgeable attorney. You can reach us anytime by calling 609-832-3202 or contact us online. Evesham Township Municipal Court has jurisdiction over criminal cases involving disorderly persons offenses and petty disorderly persons offenses, municipal ordinance violations, DWI and other traffic citations that occur within the borders of Evesham, New Jersey. If you’re a local, you may think of Evesham Township as Marlton. Disorderly and petty disorderly persons offenses are similar to misdemeanors under NJ law. Some examples of these relatively minor criminal offenses include possession of drug paraphernalia, trespassing, and harassment. A disorderly persons offense is punishable by a sentence to serve 6 months in the county jail and a maximum fine of $1,000. A petty disorderly persons offense is punishable by up to 30 days in jail and a $500 fine. If you are issued a traffic ticket for driving with a suspended license, drug DUI, or another motor vehicle violation, your case will also be heard in the Evesham Municipal Court. Potential penalties for a traffic violation may include license suspension, fines, motor vehicle surcharges, points on your license, community service, and even jail time. The Evesham Township Municipal Court is located at 984 Tuckerton Road, Marlton, New Jersey 08053. Court hours of operation are Monday through Friday from 8:30 am to 4:30 pm. The court can be reached directly at (856)-983-2929. The court administrator is Staci Heavner. Court sessions are held every Thursday at 8:30 am and the second and fourth Wednesday of the month at 9:00 am. 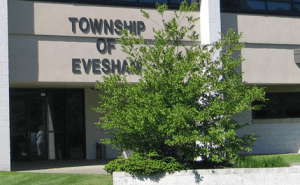 For additional information about the Evesham Township Municipal Court, visit their website. For additional information about Evesham Township, visit the Evesham Official Website. The Evesham Police Department is located at 984 Tuckerton Road in Marlton. The current Chief of Police is Christopher Chew. The Evesham PD can be reached at (856) 983-1111. To learn more about the Evesham Police Department, click here. If you are charged with a more serious indictable crime in Evesham Township, your case will be sent to the Burlington County Superior Court in Mount Holly. If you or someone you love is scheduled to appear for a criminal or traffic matter in Evesham Township Municipal Court, contact our criminal defense law firm at 609-832-3202 for a free consultation with an experienced criminal defense attorney. We will listen to the facts of your case, explain what happens next, and explain potential defense strategies that we can employ to help you achieve the best result. Simply call now or contact us online today.